These products are of simple design, robust in operation and easy to maintain. 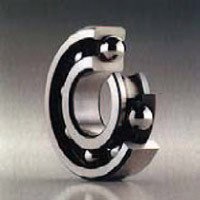 Due to their relative low frictional torque deep groove ball bearings are suitable for high speeds. The angular adjustment facility of single row ball bearings is limited so bearing positions must be well aligned. Ball bearings are manufactured with several various configurations which provide different features suitable for a wide range of applications, i.e. Angular Contact, Double row. FAG (Schaeffler) and NSK manufacture a comprehensive range of deep Groove Ball Bearings that meet or exceed ISO specifications. FAG (Schaeffler) & NSK have a range of specific products with features and benefits to offer a solution across most applications. These include industrial, automotive, food and packaging, marine, agricultural and general engineering applications. Whilst deep groove ball bearings in FAG (Schaeffler) & NSK meet the ISO standard for dimensions, all manufacturers have varying technical specifications. It is recommended that you consult your local Statewide Bearings branch and engineering team to ensure you get the most appropriate bearing for your application. Please ensure you are aware of the brand for which you are searching specifications for.